I would like to say a massive thank you to everyone for their support in helping me win the BBC New Comedy Award 2014. If you had told me when I started doing stand up comedy in February 2012 that I would win something like this under three years later, I would have thought you were mental. 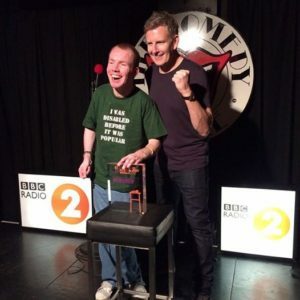 In fact, when my friend Nathan first suggested that I try stand up comedy, I thought he was mental too. I just didn’t see how it could work. I think he’s feeling very smug now! Thankfully I did eventually give it a try (the idea had stuck in my head ever since he planted it there and I knew I’d regret it if I didn’t). As a result, the last two and a half years of my life have been amazing in all kinds of ways. I’ve supported my comedy idol, Ross Noble, on his warm up tour, I’ve taken two shows to the Edinburgh Fringe Festival, and I’ve ‘sang’ a duet with The Boy With Tape On His Face in front of two thousand people. Best of all, I’ve met some amazing people. Of course, as with any roller coaster ride, it’s had some dips too. Dare I mention pneumonia. But the lovely thing is that the amazing people in my life got me through these times and I became stronger for the experience. I’ll be honest, I never expected to win the award. When I entered the competition, I was just curious about how far I would get. I was thrilled when I won my heat, and I was over the moon when I got through my semi final. So, you can imagine what I was like when I won the whole thing! I knew I’d be up against the best new comedians in the country in the final, so I was just happy to have made it that far. I wasn’t wrong either, all six acts in the final were good enough to pick up the award. The fact that both the comedy industry (in the heats and semi) and then the public (in the final) thought that I was good enough to win the whole thing means an awful lot to me. You can’t get much higher praise than that. When I first started doing stand up, I thought it was a bit of a laugh and that I’d just see how it went. It’s funny how things turn out! Thank you to everyone who voted for me in the final and everyone who has ever supported me in my comedy career. I’d especially like to thank my family, who supported me from day one and didn’t once stop me following my dream. And, let’s face it, doing stand up comedy when you can’t speak is a pretty crazy dream. I’d also like to thank everyone who have ever helped me get to a gig, especially Nathan, Emily and Stacey. Without all of you, I would still be stuck on a platform at Central Station. Finally, thank you to Danielle who always managed to put a smile on my face and give me a boost of confidence whenever I doubted my ability to make people laugh. Here’s to a very exciting 2015!